Pioneers in the design, manufacture and installation of rubber surface tiles. For more than a quarter century, SofSurfaces has relentlessly pursued perfection. We have pioneered every aspect of the design, manufacture and installation of interior and exterior rubber surface tiles. Because we aren’t satisfied with merely meeting industry standards, we have developed proprietary processes that allow us to set new standards for quality, durability and value. And independent drop testing proves that our tiles are the safest in the world. We use 100% recycled materials to create long-lasting, attractive tiles that can stand up to the harshest conditions, from weather to wear and tear. Installed by certified installation professionals and backed by a best-in-industry Limited Lifetime Warranty, SofSurfaces rubber surface tiles protect your investment and the people you serve. SofSurfaces is an ISO 9001:2008 compliant, privately owned company that specializes in the manufacturing and distribution of highly-specialized safety surfacing products for use under childrens play centers. Since 1992 our company has been committed to manufacturing quality safety surfacing products on an international basis. SofSurfaces manufactures an average of 2.5 million square feet of surfacing annually, the largest producer of impact attenuating surfacing in North America. SofSurfaces is insured and bondable both domestically and internationally. Our success in the design, manufacturing, distribution, and installation of safety surfacing is the result of heavy investment, innovation and production technology, combined with a dedicated commitment to providing each customer with a superior finished product, on time, and at a competitive price. SofSurfaces had modest beginnings as a small but committed regional supplier of poured-in-place (PIP) safety surfacing for use underneath children’s playground structures. During our initial years, our efforts were focused on perfecting the art of installing poured-in-place materials. Within those early years, however, we came to a conclusion that dramatically changed the course of the company. At a time when the company was grappling with the limits of our PIP system, the inability to incorporate an engineered design into the product, and the high dependency placed on the skill of the installer, we also came to a realization that we were installing a product whose final quality was largely influenced by environmental conditions. Since we couldn’t predict or control the weather, we recognized that we would never be able to predict or control the quality or safety performance of the final product. This conclusion forced us to recognize that our desire to lead the industry with high-quality, cutting-edge products was simply incompatible with a poured-in-place system. SofSurfaces began to develop what has since become the industry’s premier safety surfacing system. Fueled by advancements in production and process technology, SofSurfaces carefully began to develop a state of the art manufacturing process.Consistent with our new direction came a commitment to creating a product with a strong functional design element. Our dedication to the SofTILE® design yielded many firsts in the industry. 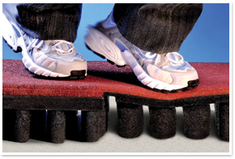 SofSurfaces was the first company to introduce the concept of a locking safety tile. Although our original design was trade named Shiplap, 13 years and 4 design improvements later, the KrosLOCK® brand entered the market. 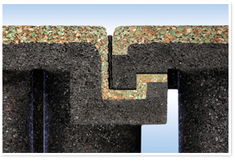 Significant advancements in product engineering, the elimination of tile to tile separation, and the ability to create a system that is truly vandal resistant, were introduced through the KrosLOCK® system and continue to be in high demand today. Having successfully met the demands of our customers by offering the vandal-proof KrosLOCK® system, our attention was turned to another industry first; our hollow-core impact pedestal. Built into the underside of the tile product, this design breakthrough accomplished something the industry as a whole previously considered unattainable. By relying on the mechanical recoil action of the impact pedestal, the hollow-core technology acts very much like a series of independent shock absorbers. This design element eliminated the need to rely on a softer and less durable product to attain the necessary fall protection. The result was a product offering extreme durability on the top surface, coupled with exceptional safety performance; a leap which solidified SofSURFACES position as the industry leader in fall protection. Implementation of our hollow-core technology laid the groundwork for yet another industry first. SofSurfaces introduced the industry’s first and only 10 Year Warranty covering durability and compliance with the ASTM F1292 standard for impact attenuation of playground surfaces. 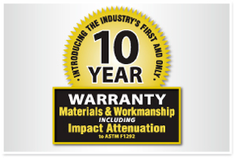 Being the first company to offer a 10 Year Warranty went hand in hand with being the first company to develop a tile system capable of performing at a level far exceeding the minimum requirements of the F1292 standard. After three years of intensive R&D, SofSurfaces completed the development of a world class production system. 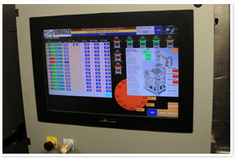 Our fully automated manufacturing facility relies solely on HMI (human machine interface) technology, with every single aspect of the process strictly controlled through advanced computerized monitoring. The resulting finished product offers extreme precision and consistency. 1 - Are existing safety standards sufficient? Early research conducted in the late 1960’s and early 1970’s established that impact severity values exceeding 1000 HIC (Head Injury Criteria) pose a risk to life. 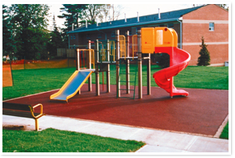 These values were eventually accepted by the CPSC, and in the 1990’s were adopted as the impact attenuation thresholds for playground safety surfacing as outlined in ASTM F1292 and EN1177; the standard specification for impact attenuation of surfacing materials within the use zone of playground equipment. During the late 1990’s and early 2000’s, advances in research within the automotive industry led the National Highway Traffic Safety Administration to require a HIC (Head Injury Criteria) measurement of less than 700 for all crash test dummies aged 6 years and older, and less than 570 for the 3 year and under age group. Our assessment of the most recent safety data led us to an obvious conclusion. Children deserve the same protection from head injury when on a playground as they do when travelling in a motor vehicle. In 2011 SofSurfaces took the leading role within the play- ground surfacing industry by becoming the first and only company to adopt the impact thresholds required by the National Highway Traffic Safety Administration. Not-with- standing the current guidelines based on a 1000 HIC threshold, our new SofTILE DuraSAFE Series has been specifically engineered to provide Head Injury Criteria ratings under the 700 and 570 HIC thresholds respectively. 2 - What is the current state of safety surfacing compliance? In 2010, SofSurfaces began an extensive testing program of unitary surfaces throughout North America. Our study was initiated with the assertion that the vast majority of play- ground surfaces were not being safety tested after installation to confirm the manufacturers claims of compliance to the ASTM F1292 standard. Our findings revealed a grossly unacceptable level of non-compliant surfaces, both new and recently installed. Our study led us to the conclusion that the unitary safety surfacing market had developed an unacceptable culture of complacency which has utterly failed the consumer. We knew that the industry was capable of much more, and as a leading industry advocate for improved safety performance, we realized that a narrow focus on the performance of our products did not sufficiently address the wide scale compliance concerns that had become pervasive throughout the industry. For this reason, SofSurfaces has taken an aggressive role in providing end users with the education and tools required to ensure that the surfaces they have invested in are performing to expectation. In addition to various training seminars that are being conducted on a national basis, SofSurfaces has removed a significant barrier to post installation fall height testing by making the required equipment widely available to the consumer for the first time. In late 2011, SofSurfaces announced our willingness to provide impact testing on all of our surfaces, free of charge. We anticipate that this offer will be well received within the industry, and by extension, will require other manufacturers to begin adopting post installation testing as standard procedure. Our objective in the coming years is to continue to advocate for higher levels of performance within the playground surfacing industry with the ultimate goal of ensuring that every playground surface installed is field tested to ensure safety compliance. Follow us on social media for the latest news, installs and promotions for DuraSafe, DuraTrain and DuraStrong products.